So, first of all, I was contacted by Richard Bales (link to his TalkBass profile) who disagreed with my opinion that shimming can cause the sort of ski jump deformations I mentioned. He directed me a thread on TalkBass where he and a number of others had looked at ski jumps and had come to the conclusion that shimming was not a factor. Now, I have a feeling that Richard’s first email had a slight you’re-totally-wrong-stop-saying-this undertone. Although, to be fair, that could completely be down to my reading of the email which — even though I try to keep an open mind on these things — was probably a bit where’s-this-guy-get-off-telling-me-I’m-wrong? So, I read through the tread and, if I’m honest, I wanted to find some flaw that proved I was right and they were wrong. As it turned out, I think neither of us was wrong. Rather we were talking about different things. I’ve been using the term ‘ski jump’ (or more recently, I seem to have unconsciously begun using ‘ski-slope — sorry; mea culpa) to refer to a deformation at the very end of an instrument neck. This affects the last few frets only and I maintain it’s correlated with ‘short’ shims. However… Richard and his colleagues use ‘ski jump’ to refer to a different problem. They use the term to describe a condition that can occur on an instrument neck where the neck deforms further down — usually between the octave fret and where the neck joins the body. I’d always known this condition as ’12th fret kink’. Here’s a good image to demonstrate the 12th fret kink (this one’s particularly pronounced — they’re not usually so bad). So, when I talked about ski jumps due to shimming, they (rightly, I think) couldn’t see how the two things were connected. I’ve made a diagram showing the comparisons. Their ski jump neck deformation is very different to what I referred to as a ski jump. I discussed this misconception with Richard and we’ve had a few useful back-and-forth emails on the subject since. So, where does that leave my neck deformation and the shimming question? Well, while I think Richard is more open to the possibility now, he’s not fully convinced on my ski jump. That’s ok — I’m not 100% convinced yet either. I said as much in my last post on the topic. More evidence is needed to be more certain but the correlation that I’ve seen is compelling to me at least. And, certainly, it won’t hurt to shim a neck with a full-pocket shim so I’ll continue to advocate for it. It can only help. I’m going to kick off my own experiment on this soon. Of course, this is unlikely to generate a result quickly but I’ll keep you informed. That does lead us to the question of terminology. I’m not quite sure where to fall on which is the ‘correct’ way to use the ‘ski jump’ term. Reading through the TalkBass thread in question, it seems there were a couple of contributors using it to describe my neck deformation rather than the ‘12th fret kink’ type. 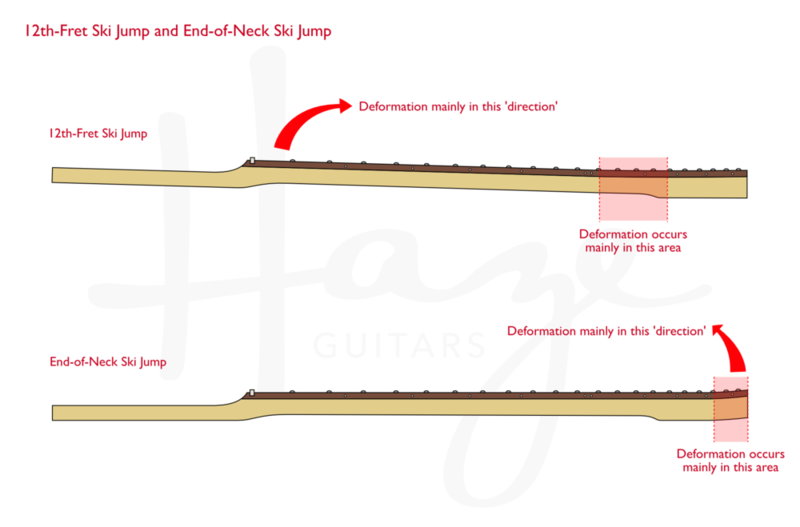 A little googling and it looks like there are at least as many results for the end-of-neck ski jump as for the 12th fret kink ski jump. Maybe both terms developed independently to describe different symptoms or maybe one was misapplied somewhere along the line and it stuck (that sort of thing happens easily — cough… tremolo bridge… cough). I had considered completely redefining my last-few-frets deformation to something like ‘hockey stick’ or similar but I’m concerned that ski jump is already widely used for both these conditions. It’s a tall order for me to redefine it. I think I’ll just add some clarification to the ‘ski jump’ term when I use it. So, I’ll use ‘end-of-neck ski jump’ for my deformation and will use ‘12th-fret ski jump’ for the other. The jury’s still out on whether shimming, absolutely, causes my end-of-neck deformation. That said, I feel there’s sufficient evidence (and no real down-side) to advise against short shims and will continue to do so. I’ll experiment and monitor over the next while. I agree that shimming is, almost certainly, not a cause of the 12th-fret ski jump (or 12th fret kink) discussed by Ricard et al. in that TalkBass forum thread. Their thoughts on that problem — and on neck construction and weakness — there are well worth a read. I’ll use the ‘end-of-neck ski jump’ phrase to describe this from now on. I’d encourage you to do the same in an effort to avoid future misunderstandings. My thanks to Richard for his help and for passing on his knowledge on this. Appreciated.